To many, Sebastian Masuda is a living legend and considered to be one of the most influential artists and designers working within the "Harajuku Kawaii" scene. In the 90's Masuda gave birth to the Tokyo street fashion craze which went on to inspire designers around the world, and remains hugely popular with fashion fans today. Most recently, Masuda has relocated to New York where he is pursuing his first love, avant-garde art. Style Wylde caught up with Masuda for a chat about fashion, 90's nostalgia, and his current public-art project, Time After Time Capsule. SW: Before we get to your current project, I want to go back in time to the origin of your 6%DOKIDOKI label. Sebastian Masuda : To the 90's? SW: Yes to the 90's! It has been written that your shop was originally designed to be a place where you could showcase your artwork, and that because of your involvement in the Tokyo Techno scene, and your interest in the Los Angeles Rave scene you also stocked pieces for your friends to wear out to club nights, can you tell us a little bit about those early days in Tokyo? Sebastian Masuda: In 1995, when I started my line, there was a street walk in Harajuku where everyone would gather together and express their own personal take on fashion. At that same time I was really into rave culture especially the L.A. West Coast rave scene, and stocked pieces in my store that people could wear to raves. But at the Harajuku street walk people from all different cultures and styles came together, and we all started getting ideas and inspiration each other, from a wide variety of different fashion styles. Japanese people are really good at drawing on things that are already out there, in the world and in fashion, and then taking it and rearranging it, making it their own. We were doing that in the 90's in Tokyo. Everyone was mixing up different styles in fashion and making it our own. This is really the origin and inspiration behind of 6%DOKIDOKI. SW: What do you think was driving the desire back then to make something totally new, to mix different looks together? Sebastian Masuda: In the 80's in Japan there was a lot of minimalistic, monochromatic fashion. That is what was popular. So, in the early 90's people just wanted something new and different. SW: So when you first opened your shop, and you were selling pieces for raves, and this brand new 'mixed up' style, what made you decide to design your own line? Sebastian Masuda: When I opened the shop 6%DOKIDOKI, I never intended to create my own fashion pieces. I never intended it to be a brand. But a lot of the fashion people from Harajuku started coming in and requesting that I make specific things for their outfits. So I started making pieces for this fashion group! I took their feedback, made my own pieces and a lot of people liked it, I was a hit. And more and more people started coming into the store. I started collaborating with a lot of different people in the Tokyo Harajuku fashion scene, and it really became the Harajuku Style. But, the style was never something that I dictated, it developed on its own. It was made by all of us, all the people in Harajuku. SW: And when did you know that it had become something much larger than underground Harajuku fashion for ravers? Sebastian Masuda: In 1998 the brand Benetton made ads with people wearing Harajuku styles. It was the first time the whole world had picked up on fashion that was really born in Japan. SW: Let's jump forward now to 2014, the last time you were at the J-POP Summit Festival. You appeared with Kyary Pamyu Pamyu and the Moshi Moshi Nippon event. How did you start working with Kyary Pamyu Pamyu? Sebastian Masuda: In social media, Harajuku Kawaii culture really exploded. All the way back in 2008 I started getting e-mails from people all over the world who were requesting me to come to their city and bring this fashion and culture. In 2009 alone, I visited 25 cities around the world. Among these fans, from all over the world was Kyary Pamyu Pamyu, and because she was such a big fan she asked me to be the art director of her video PONPONPON. SW: In addition to Kyary Pamyu Pamyu, and all the street fashion fans throughout the world, I've noticed a lot of high-end designers have started drawing on Harajuku Street style for inspiration. Some even seem to be doing an exact replica of the Harajuku Kawaii look for their couture shows. Does it surprise you that this is happening? Sebastian Masuda: It's not surprising, right now the fashion seems to be all 90's revival. Just recently trends were more simple, it was Normcore. But right now the direction is moving back towards a more colorful, decorative style. Fashion is heavily connected to what is going on in the world. Because of all the terrorism, and there is so much sadness and grief in the world, what we want now is happiness. I think this is really similar to what happened in 1968 with the flower children movement. The Vietnam War was going on, there was a lot of death and grief in the news, so people reacted to it and wanted more happiness. SW: The opposite reaction to current events, do you think popular fashion wants to bring balance? Sebastian Masuda: Yes, I think in times of war you might think people would dress in dark, somber colors, but people crave happiness in these times, they are drawn to the opposite of what is going on, bright colors, prints. This happiness is the message of Harajuku Kawaii style. SW: I understand that now you've refocused on avant-garde art as your main vocation, getting away from fashion for a while. What inspired you to do this? What have you been working on? SW: How did that go, was the reception to your work what you expected? Sebastian Masuda: When I originally planned the show I expected that only Harajuku fashion people, and fans of Kyary Pamyu Pamyu would come, but it didn't turn out that way at all! The gallery could only fit 5 people at a time, and over 1,000 showed up! SW: So it attracted a big New York art crowd? That must have been a surprise? Sebastian Masuda: Yes, I thought in addition to fans of Harajuku style maybe Cosplay people might come, but when I walked through the crowd there were none of those people there, it was totally different group than I had expected. I think because of pop stars like Katy Perry, Nicki Minaj and Lady Gaga promoting Kawaii culture, a big variety of people were interested in what it was all about. That is why they came to my show to learn more about Kawaii culture. SW: So today, you are here as a stop on your Time After Time Capsule public art project. Can you tell us a little bit about the project? Sebastian Masuda: The idea of Kawaii fashion is that it is specific to each individual. Each person makes it their own. I started thinking about all the different people in Kawaii culture are like stars in the sky. I started thinking about doing something that would show all the stars. That is what the sculptures are, they show pieces from all the people, who place any item they want into the sculptures. I then got the idea to go to 20 different cities around the globe with the sculptures. Then before the 2020 Tokyo Olympics I want to stack all of the sculptures, filled with stars from all over the world into a giant tower. It is a project to share the dream of the future together. 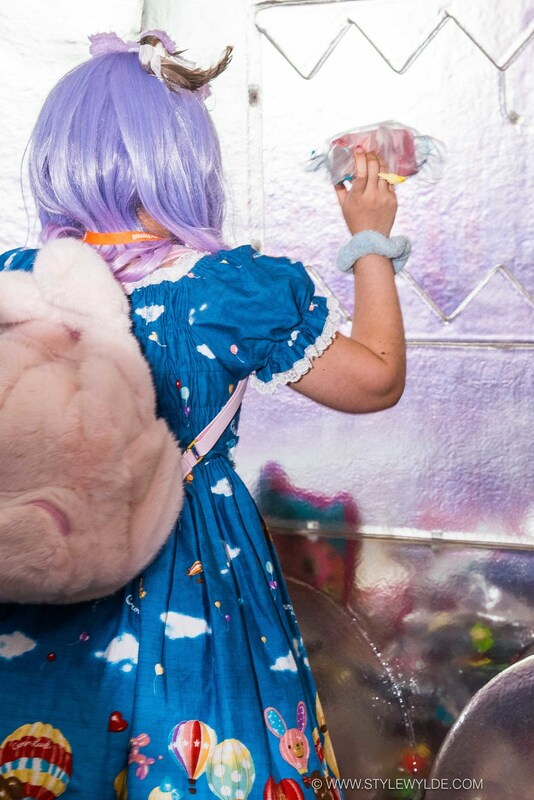 I've created a different character sculpture (Ed note: see photos below of the San Francisco's DOMO sculpture, and of J-POP attendees creating messages to place in the Domo.) for each city. The only problem now is, it has gotten a lot of attention, and I've had so many offers from different cities to come. But there is only one of me, so I have to figure out how I am going to make it all work! All images: Cynthia Hope Anderson for Style Wylde. This interview was conducted via a translator.